Had in Ancient Egypt the Goddess Nephthys a Lower Status? There is a scene of the Book of the Dead from the tomb of Ay, in which are depicted on the solar boat the gods of the Heliopolitan cosmogony and the Myth of Osiris (apart from Seth): Re-Horakhty, Atoum, Shu, Tefnut, Geb, Nut, Osiris, Isis, Horus…and out of the boat Nephtys stands alone apart from her fellows. Why? Isis and Nephtys were usually represented together. They were a perfect divine team in Ancient Egypt for the favour of the Osiris’ resurrection. They were always depicted both collaborating together for the corpse’s resurrection. However, Nephthys had in some way a secondary role and maybe not the same prestige as her sister Isis. Firstly, Isis was the wife of Osiris, the dead god, so she supported the main responsability in the regeneration of her husband’s body. 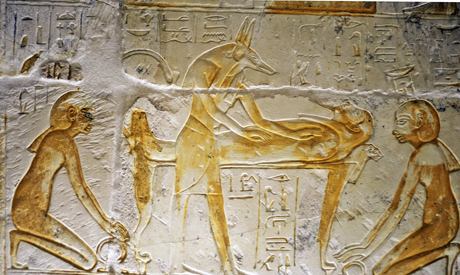 Isis, although assisted by Nephthys, was the one who made the ancient Egyptian mourning ritual on the mummy of Osiris for restoring his vital faculties. Resurrection scene from the tomb of Maya in Saqqara. XIX Dynasty. Photo: ahramonline. On the other hand, Nephthys was not the wife of a valued god. According to the lore of Ancient Egypt her husband was Seth; he was the one who killed Osiris, so Seth was the incarnation of the evil. We can afirm that Nephthys had not married well. 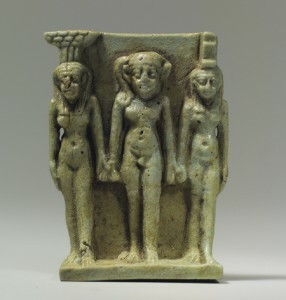 Isis, Nephthys and Horus. Late Period. Photo: Metropolitan Museum of Art of New York. In addition, Nephthys was not officially mother. And maternity was a very important element in this duet of mourners, since maternity granted the resurrection of the dead as a new born. The real mother of Horus was Isis. Nephthys just help her sister in her duties as mother, as a nursemaid. Finally, in an Old Coptic magical text Isis accused Nephthys of adultery. There is a version of the lore which counts how Osiris met Nephthys thinking that she was Isis. With this confusion Nephthys could seduce Osiris and have a sexual union with him. According to some versions of the lore from this union was born Anubis. This was a very important god in the pantheon of Ancient Egypt, whose family ties are not clear. In any case, ancient Egyptian had arguments to consider Nephthys with less prestige. Nephthys had her value among the gods of Ancient Egypt thanks to Isis and her high position in the ancient Egyptian pantheon had a weak spot due primarily to the adultery and her bad marriage. Maybe for that reason she appears apart from the rest of gods in the scene of the Book of the Dead from the tomb of Ay. Nephthys in Ancient Egypt, Assitant of Isis. Interesting question. The Ennead seems to be representing divisions of powers that proceed in an orderly manner until Seth and Nephthys appear as secondary children of Nut and Geb. Seth is sometimes not represented due to fear of his power and Nephthys though represented, is given the outsider treatment. Perhaps that is why?